Love DistrAction is the UK’s number one official tribute to The Human League. Utilising a clever mixture of live synthesizers and guitar, this truly accurate, authentic, dedicated and genuine tribute act capture the exact mood, essence and feel of The Human League. The band consists of Nic Price, who delivers an uncannily accurate vocal portrayal of the mighty Phil Oakey, Nick Stylianides, Musical Director, programmer and live keyboards and Russ Harvey, programmer, keyboards and live guitar. There are also a small group of talented professional singers and artists, taking on the roles of Susan Sully and Joanne Catherall. Formed in August 2017, they have enjoyed rapid success, playing an impressive mixture of shows all over the UK, including the extremely popular Butlin’s 80s weekenders, Pontins 48 Hour Party Weekenders, Theatres, Music venues, Festivals, Private and Corporate functions. Known for their ability to sound exactly like the iconic 80's group, Love DistrAction’s attention to detail and musicianship is the reason why many are already referring to them as the UK’s premier Tribute to The Human League. There may be other bands who look the part, but Love DistrAction is as true as it gets to the real thing, with their captivating concert style show, guaranteed to bring back special memories, keeping you fully entertained and mesmerised from the time they walk on stage, right through to their breathtaking finale. 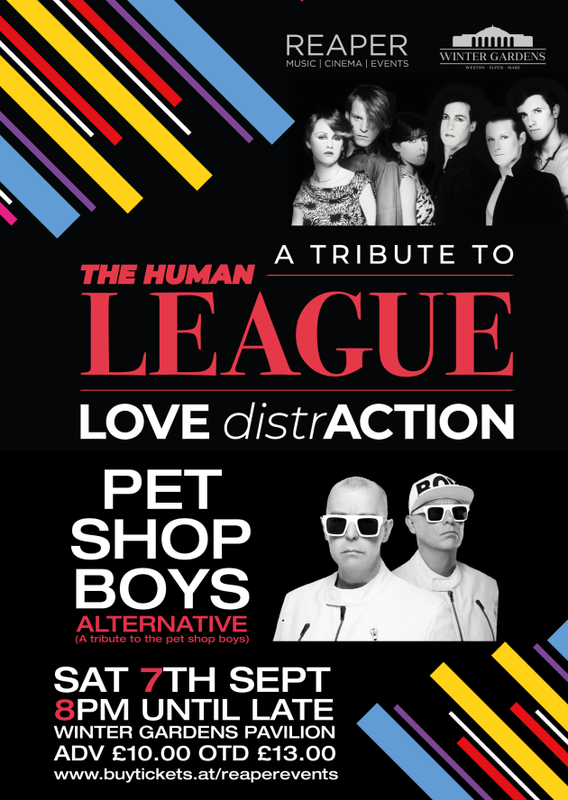 Joining Love DistrAction on stage is Alternative, the UK's only Pet Shop Boys Tribute. Alternative have been a successful tribute band for the last eight years. During this time they have witnessed amazing venues and unforgettable crowds with an uncanny likeness to Neil Tennant and Chris Lowe. ​The show includes wonderful costumes and a imaginative set plus a talented team including four highly skilled professional muscians including electric guitar and electric drums with energetic and authentic choreography.